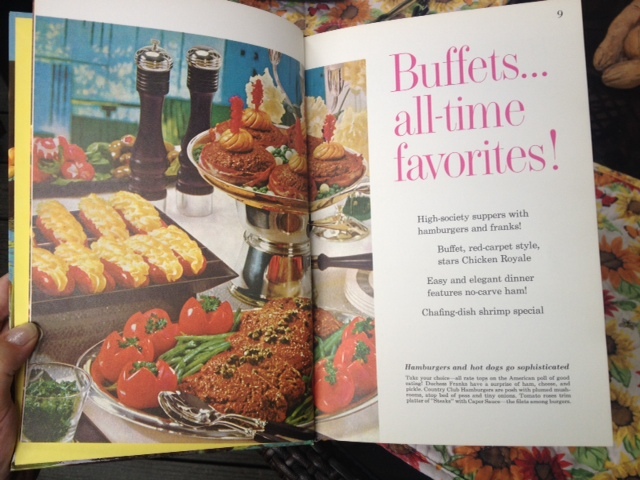 When we’re not obsessing over 1980s Seventeen Now You’re Cooking pages, we’re smitten with Better Homes and Gardens 1950s and 60s cookbooks. 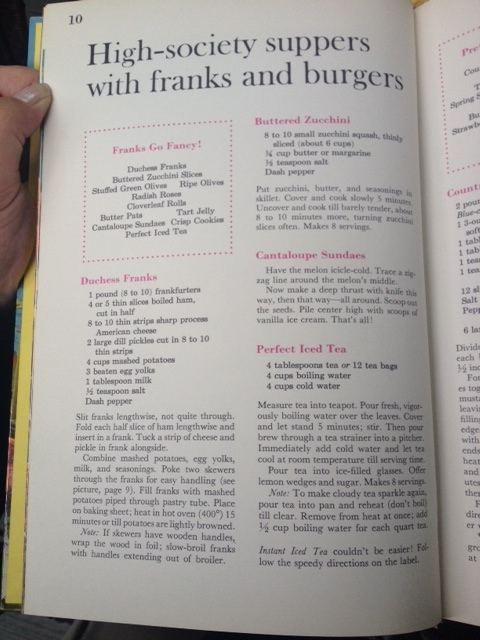 And get a load of these “high-society franks.” Highly questionable, more like. 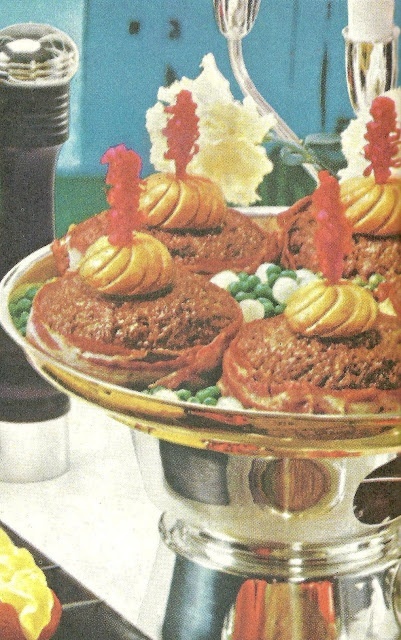 Stuffed patties are a bit of work, but we are intrigued by the bacon collar and think these patties would be exceptional served sans buns and with a spectacular summer veg and herb salad. Egads: what if you subbed in split, grilled kielbasa for the franks, swapped the pickle for sauerkraut topped with the same duchess potato topping. Very prairie! Photos to follow! 12 slices bacon, precooked slightly (we will look for the thinnest slices possible). Divide ground beef in 12 mounds. Flatten each between squares of waxed paper to 1/2 inch thickness. For Blue-cheese filling, cream the cheeses together; stir in onion, horseradish, and mustard. Top half the patties with filling, leaving 1/2-inch margin for sealing. Cover filling with remaining patties, sealing edges well. Wrap edges of each burger with the bacon, using 2 slices and securing ends with toothpicks. Broil 5 inches from heat about 6 minutes; sprinkle with salt and pepper. Turn and broil about 5 minutes more or until done just the way you like them; season second side. Flute the mushroom caps. While burgers are cooking, lightly brown mushrooms in butter (we’ll let them bubble away in our mini cast iron frying pan on the grill, maybe with a shot of brandy). Top each burger with a mushroom. *If beef is lean, have 6 ounces of suet ground with this amount. Burgers will be at their very best!